A few years ago I wrote a guide on how to figure out when to start your seed and made a free seed starting online calculator. 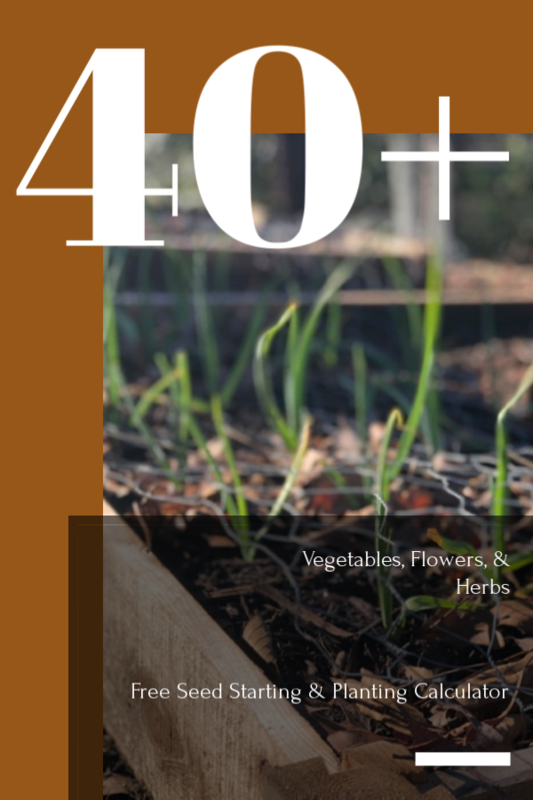 It needed an update… Badly… I am pleased to introduce the new (also free) Temperate Seed Starting & Planting calculator. Simply put in your first and last frost dates for your region and over 40+ of the most popular vegetables, herbs, and flowers will automatically calculate when you should plant your seeds. I love sounding like an infomercial! No truly there is more. With only two dates, you can now calculate when to start seed indoors, when to plant seedlings or seed outdoors, when to plant seeds for a fall yield, and dates for succession planting. All in one sheet! I also added a second sheet with planting details such as seed depth, seed spacing, ranges for harvest, and sun needs. I find it useful to have all those details handy when I get seed from seed swaps or order from companies (ahem… Baker Creek) that assume I just know when to plant this and that. I have a good memory… But not that good! Are You an Old School Seed Starter? Lots of people still like paper and pencil and that’s okay. In my previous guide to calculating seed start dates I outline exactly how to calculate all the seed starting dates by hand. (Linked for you convenience) You can still use this free seed starting calculator to see the number of days before frost, days to harvest, and days for succession planning to use in your calculations. So How Do I Get/Use this Seed Starting & Planting Calculator? Click on this link to the Seed Starting & Planting Calculator to make a copy for your own. Follow the planting dates! They should work for most temperate climates. If you are approaching the arctic or tropical zones will need to use techniques to either extend your season or shield cold loving crops from the heat. Dates for succession and fall planting are triggered by the X for (wait for it) in the Fall and Succession planting columns. They are calculated by the first frost date, days of harvest, and recommend succession planting dates. If you want longer times between successions you can change the time in the second Planting Tips sheet. I mention it, because succession planting dates are much more subjective depending on the actual days to harvest, and how much of a crop you want to get. I just can’t eat that many beets or lettuce and would never want to plant them at such small intervals, but technically you CAN! I also think it is important to note that crops that don’t make good fall candidates are set to be harvested 45 days before first frost. Generally, those warm weather crops just seem to start lagging when the sun decreases and cooler temperatures appear, but you could technically push the growing season longer. I’m also very conservative and have cool weather crops harvesting 2 weeks prior to frost for fall and succession planting. Why? Because if you happen to have a cool autumn their growth will be stunted and you can run the risk of not getting a final fall crop. There many ways to extend that fall crop with row covers, tunnels, cold frames, etc. However, this sheet is meant to calculate growth in open ground or open raised beds. Why a Free Seed Starting & Planting Calculator? Honestly, I couldn’t find a calculator or excel sheet that did it all. A number of gardening websites offer utilities to calculate seed starting dates OR succession planting OR fall planting, but not all of those dates in one place. The seed starting utilities also tend to forget about first frost when figuring succession days. So yep, I thought I could make something better, and so I did. All I ask in return is that if you find this free seed starting and planting calculator useful that you share this post with others on social media or comment below. Also if you want me to include additional vegetables, flowers, or herbs comment below! I’ll see what I can do!